The No. 8 Tufts women’s tennis team went 2–1 in its three matches in Southern California over spring break, bringing its record to 3–2 on the season. The Jumbos began their trip in Northridge, Calif. on March 18 with a 7–2 win over the No. 27 Whitman College Blues. Coming off a 9–0 victory at Wellesley the weekend prior, Tufts’ confidence was high going into its match against Whitman. The Jumbos won all three doubles matches to take an early 3–0 lead over the Blues. Playing in the No. 1 spot, juniors Mina Karamercan and Otilia Popa dominated the Whitman pair of sophomore Andrea Gu and senior Hanna Greenberg in a quick 8–1 victory. Sophomore Kat Wiley and first-year Patricia Obeid won the sole competitive doubles matchup, with a 9–7 win over juniors Lori Sheng and Mary Hill in the second position. In third doubles, Tufts senior co-captains Zoe Miller and Lauren Louks handily defeated their opponents by an 8–0 scoreline. Heading into singles play, the Jumbos were in position to comfortably defeat the Blues. Obeid won in No. 1 singles for the third consecutive match to begin her collegiate career, defeating Hill in straight sets (6–3, 6–0). Karamercan and Wiley also had standout performances in the third and sixth positions, respectively. Karamercan conceded just one game to Sheng in recording a 6–1, 6–0 victory for the Jumbos, while Wiley went one better by not losing a single game in her straight-sets rout of Whitman senior Jenna Gilbert. Miller added a 6–4, 6–0 victory in fifth singles, as Tufts dropped just two matches to record the win over Whitman. Due to an illness that affected eight members of the team, Tufts was forced to cancel its second match of the trip against the tenth-ranked University of Chicago on Tuesday. However, the team was able to play the following day against Claremont-Mudd-Scripps in Claremont, Calif. The Jumbos struggled with their weakened lineup, as they fell 5–4 to the Athenas, who are currently ranked third in the country. The hosts eked out a 2–1 advantage in the doubles matches, as Karamercan and Popa were the only Jumbos to record a win over their opponents. The Tufts duo defeated senior Lindsay Brown and sophomore Nicole Tan by a score of 8–4. Trailing by one, Tufts needed to take four of the six singles matches to defeat a Claremont-Mudd-Scripps team that had opened its season with 15 straight wins. 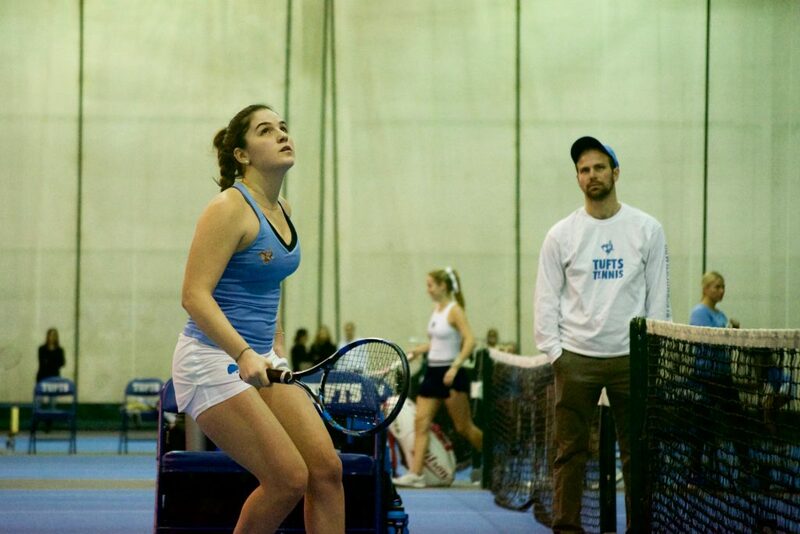 Ultimately, Tufts could not overcome the deficit, as the teams split the singles matches. Despite the disappointing result, the Jumbos’ ability to compete so closely with one of the top teams in the nation gave them positive energy heading into their final match of the week, against the No. 5 Pomona-Pitzer Sagehens on Friday. Against Pomona-Pitzer, a pair of doubles wins — the first from Karamercan and Popa, the second from Miller and Wiley — gave Tufts an early lead. In singles play, Karamercan and juniors Tomo Iwasaki and Julia Keller clinched wins for the Jumbos. Karamercan defeated Pomona-Pitzer junior Summer Garrison in a decisive 6–1, 6–0 victory. Iwasaki also won in straight sets, beating senior Shivani Doraiswami 7–6, 6–4 in the fourth spot. With the overall score even at 4–4, Keller’s match against Pomona-Pitzer first-year Jacinta Chen decided the contest. Keller — a native of Lidingoe, Sweden — fell behind early, with Chen taking the first set 6–2. However, in the first singles match of her spring season, Keller did not show any nerves. Capitalizing on the support and energy of her teammates, Keller won the second set 6–4 to even the score and force a third set. Keller went on to win the third set by a 6–4 scoreline to clinch Tufts’ first victory over Pomona-Pitzer in three years. The team traveled back to Medford on Saturday with added confidence from its key win over Pomona-Pitzer. Tufts now enters the NESCAC portion of its schedule with work to do, having fallen to No. 4 Middlebury in its season opener. The Jumbos will host the Trinity Bantams (3–3) on Thursday.